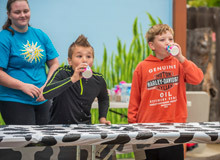 Have fun till the cows come home on Saturday and Sunday, September 8 and 9 from 9:30 a.m. to 3 p.m. at the Northwestern Mutual Family Farm for the annual Family Farm Weekend, presented by Prairie Farms Dairy. 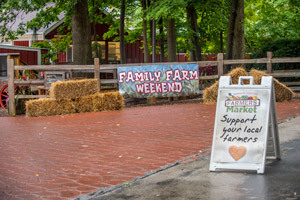 Visit the Zoo as we highlight Wisconsin’s rich farming history with fun farm-related activities the whole family will enjoy. Shop locally grown produce, take part in a milk chugging contest, learn how to make ice cream and so much more! Wisconsin Spudmobile: Jump aboard the spudmobile, a mobile education center! From the farmer’s field to your plate, learn the potato production process. Demonstrations: Try your hand at making your own tasty treats, learn how to weave a basket and how the process works to get milk to your mouth! Farmer’s Market: Pick up fresh local produce, as well as other farm-fresh items from Wisconsin farmers. Buy local and eat local. Wisconsin is home to over 77,000 farms, each around 195 acres (slightly larger than the Zoo’s own working farm)! Learn where your food comes from and how it’s made when you visit the Zoo’s farm on September 8 and 9 from 9:30 a.m. to 3 p.m.
All activities are free with regular Zoo admission. For more information on the event, call the Zoo at 414.771.3040.